Serendipity. No, it is not a useless and, worse, misguiding “Study Bible.” It is when various random things happen together to produce something positive that you weren’t shooting for. Happened to me today. I got stuck (or so it seemed to me) doing the “Lectionary at Lunch” for the Romans 11:33-12:8 text this week, since no one else had signed up for it, it’s my job to get people signed up, and Concordia Seminary faculty members on campus in mid-August are about as common as Cubs fans in St. Louis. Literally. So, I “volunteered” myself. Sorry if it gets posted late. Romans 11:33-36 is easy. It is a hymn of praise. What else could Paul have possibly written after describing the mercy of God for all people (Jew and Gentile) in Christ? It is at 12:1-2 that things get dicey. I won’t repeat what I said on the L@L recording. Whatever I said wasn’t, as usual, exactly what I wanted to get out. Fast forward to this afternoon, and I’m working on another assignment, this on biblical interpretation and “difficult passages” (women, slavery, sexual ethics, stuff like that). And what I was trying to type into my word processor sounded a lot like what I was just saying on the L@L recording. Best, then, to make sure that I’m not completely making it up (and have a few footnotes). And so I went to my go-to exegete, Martin Franzmann. There it was, 43 years ago, and way better than I could say it. For some reason we Lutherans have a hard time with what we (not the Apostle) call “Sanctification.” That is, what happens after you “get justified.” We fall into one of two ditches: either we never preach it because we are afraid of having people think that their salvation depends on it (and, ironically, both “Gospel Reductionist Libs” and “Confessional Law-Gospel” types both do this) or we preach only stuff that we think we should get our people to do, lest they fail to “give glory to God” or don’t receive the “full promises” of God, or some other “Evangelical” (in the American sense) phrase. Either way, notice that biblical “Sanctification” never gets preached. Then you read the Scriptures. Most preachers will probably run to the Gospel Reading this week, because it is easy to make it say what we think it says (“Christ,” “Church,” easy-peasy stuff, right?). But I’d commend to you the Epistle Reading. Because it will force you, and your people, to wrestle with Monday. That is, what does life “in Christ” (Rom 12:5) look like? Yes, confess with Peter Jesus as “The Christ.” But confession is never mere lip service. Recall that with the confession comes picking up crosses, and following (Matt 16:24; the reading conveniently stops at 16:20). The connectedness of Matthew 16:16 and Matt 16:24 is the connectedness of confessing Christ and living in Christ. That’s what I, and probably most of your congregation, struggle with. And this where the Apostle, and our father in the faith, Martin Franzmann, help guide us. The members of the new people of God are called upon to anticipate, in their bodily activitiy, the life of the world to come, to assert in action the reality of that world now. They are to be God’s bridgehead in the alien and hostile territory of this world in this age. Consequently their worship is a constant and embattled no of noncomformity to this world. . . They [this “new people”] can continue to be the strenuous minority for God in this age only by being perpetually transformed by the mercies of God brought to them continuously in the Gospel. The Gospel is their only power, that “Word of God at work … in … believers” (1 Thess 2:13). This is not a mystic’s dream of being absorbed into the life of God; it is a conscious, waking, responsible life in the presence of and in the service of God. In every case, as each case may arise, the child of God is called upon to “prove” the will of God, that is, to weigh and ponder and decide what the revealed will of his Father God is asking of him now. The child knows that will; it asks of him that what he says and does be “good,” that it be a kindly, gracious furthering of the welfare of the man whom God has set before him as neighbor. Martin Franzmann, Romans. 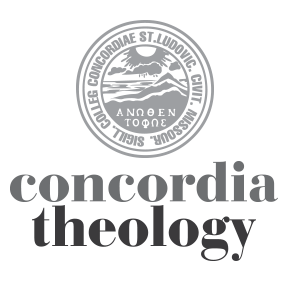 Concordia Commentary (St. Louis: Concordia Publishing House, 1968), 217-18. [I’ll stop there, lest I break copyright law; if it helps keep the lawyers off my back, here is a link where you can buy the book. Note to the ad people over at CPH: your description sells this book way short; I’m not at all sure what a “narrative(!) interpretation” of a letter(!) would even look like ]. Catch those key words: “bodily activity,” “now,” “anticipate,” “perpetually transformed,” “mercies of God,” “responsible life,” “neighbor.” That’s Roman 12. That’s the Apostle. That’s confessing Christ. What does it look like “now“? Paul spoke that Word (because it was “given” to him; 12:3)) to the Church in Rome. It is your task, preacher, to speak that Word to the Church in wherever-you-are, because it is “given” to you: “The one who teaches, in the act of teaching; the one who exhorts, in the exhortations” (12:7-8). So how will Christ serendipitously be confessed by you today? I’m still getting to know my vicarage congregation having only been here since the first. But one thing I vividly remember seeing is in the book shelf in the basement of the church Franzmann’s Romans commentary and thinking to myself, “I’ll have to borrow that at some point.” One advantage I have is that my apartment is within the church building, so I just ran down there and brought it back up so I can now enjoy the full context of the quote you have provided, thanks! An additional reason I am excited about this quote is due to having read a lot of NT Wright lately and his whole kick on reading Paul’s words about the present implications of a future resurrection. I always wondered why Lutherans were not more out front with that. I have been corrected tonight and I am pleasantly surprised! Thanks again. Apartment in the church building? I had the same deal on my vicarage. And there wasn’t even a church library handy. Just a big, empty, dark building. In Flint, MI. Great people, but the town had been hit pretty hard by the time we got there. Wright has a lot of good stuff on the resurrection and new creation (better said: he reads the Apostle pretty well). But everyone has “issues” in their reading. Even Franzmann. Maybe you can get your friends at CPH to make more of Franzmann’s works available via Kindle. The only thing available now is “The Word of the Lord Grows: An Introduction to the Origin, Purpose, and Meaning of the New Testament”. I have just downloaded it, but the Romans Commentary would be good one to offer next. I still like “biblia” (texts on pages, whether papyrus, parchment, or paper). Lets me do my underlining, arguing in the margins with the author. And I have a book from 1968 that I can still open up and read. Try reading a text that you bought for your Kindle in 2054. The Word of the Lord Grows is a fantastic book. Read again the first chapter: “The Historical Character of the New Testament World,” which is not a bland recounting of facts and dates but a theological unfolding of how the New Testament reflects the working of God in history toward his goal of the new creation. Great stuff. I find Wright’s critique of Lutherans (or the traditional perspective) to be wanting in a lot of areas, and I think that Franzmann can write something like this shows that. Although at the same time I know the kind of Lutherans Wright speaks against, but it’s the wholesale, “This is what Lutherans believe” position that I find less than adequate. This whole section from Franzmann is pretty cool though. From the title, The Gospel Creates A New Worship For The New People Of God, right through his exposition. On 216 he had this interesting take, “The worship of old Israel was regulated; the new worship is inspired, not imposed on man but created in man by the God who gives life to the dead.” He then goes on to recount what has come before this in Romans specifically in chapters 6-8, which is always helpful for a discussion like this. On 217 then is where he picks up with the living sacrifice bit, and I’m sitting here going, “Oh yeah, duh.” Since Lutherans are biblical what’s the issue here? I don’t know that we need to follow any and all law statements up with the Gospel(? ), “But remember, you’re worthless and can’t do anything, thanks be to God!” In that middle paragraph on 217, right before where you quote, Dr. Kloha, he even gives us a nice picture on what it means to participate in “Spiritual Worship.” I don’t know, I think this stuff is not only fun from an exegetical and theological standpoint, but also incredibly applicable to the folks outside dealing with life and hungry for some form of meaning. You’re right, Matt, what gets called “Lutheran” in scholarly literature has little to do with Luther or the Lutheran Confessions, but is Luther as run through Kierkegaard on down through Bultmann. Shows you how poorly we Lutherans are at doing our job of helping the rest of the Church, of which we are a part, keep Christ in the center. So, you think learning how to read the Scriptures is “practical”? Who’d’ve thought? Thanks for your article Dr. Kloha. Your quote “Most preachers will probably run to the Gospel Reading this week, because it is easy to make it say what we think it says (“Christ,” “Church,” easy-peasy stuff, right?). But I’d commend to you the Epistle Reading. Because it will force you, and your people, to wrestle with Monday” has inspired me to change my mind and preach on this text. Hopefully it won’t be “easy-peasy” haha. With the Kindle or Kindle app you can highlight and keep notes! In fact I can even see other passages that a large number of folks highlighted. And you can upload them to the “cloud”, so who knows where they will be in 2054! I will ping CPH, thanks. Sorry, Jeff, I’m stuck in 2009 — I don’t float on a cloud, nor do I ping. I never made it past the iPhone, and I deleted my Facebook page. Someday we need a discussion about texts and libraries, both personal and corporate (like CSL’s). With electronic media you find only things that someone links to, or that you (or some bot) searches for. But you are limited to your (or the bot’s) search criteria. Some of the best material I’ve come across has been sitting on the shelf near the book I was looking for, or was another essay in the same journal of the article I had been looking for. Heck, try scanning your own bookshelf — there is probably something there that you never read (or half-read but didn’t see the value of initially) that would be very helpful right now. “Book” as “physical entity” is not something that I’m ready to give up yet. At least until all texts are just downloaded into my brain (forget clouds, this is coming). Six months ago I was I complete agreement and I would never get e-version of the Concordia Commentary, since I just love the physical look and feel of them. But I started reading on the iTouch and now iPad and am hooked. And with many works by Gerhard Forde and Oswald Bayer in Kindle versions, as well as quite a few CPH books available, I can feed my love of books, and my growing love of the Lutheran tradition without having to move to a bigger apartment (i have limited bookshelf space). And I can have them al with me at one time, so I can read whatever strikes me. Though strolling through the Concordia Seminary Library sounds like a treat. Martin Franzmann’s ROMANS COMMENTARY is now in a Kindle version! I bought one of the $79 kindles the day it was announced — I had a long trip coming up and I could put several books on there. So far, I like it for subscription news resources, casual reading that is not directly related to something I’m working on, and books I plan to review. The best things about it is the ability to highlight stuff, save it to your online clipboard, then cut-and-paste that with comments into a info app like Evernote. Pretty slick. Still, the Kindle for reference books like commentaries I’m not sure about, though I haven’t tried one. And, I got Eco’s new novel in hardcover. I was actually a bit disappointed that the printing, paper, and binding is all pretty cheap. Eco is great, though. A good read in a quality codex is still a delightfully corporeal experience.